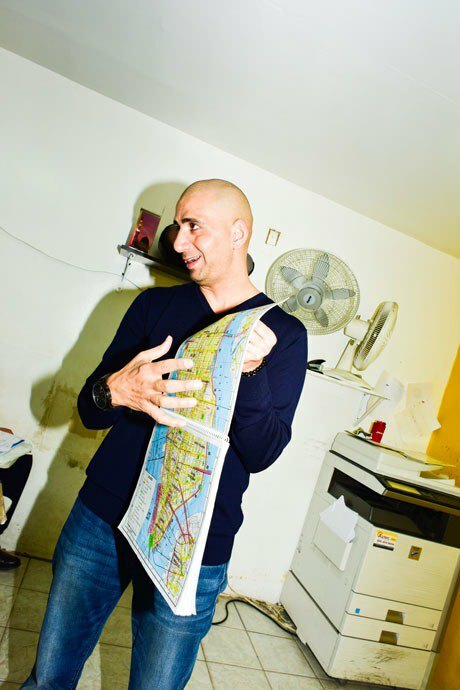 In Jackson Heights, Queens, AJ Gogia runs his cab driving school like a strict headmaster. His charisma has landed him in the year's most acclaimed documentary and brought offers for a reality TV show, which he rejected. It's a few minutes before class time at AJ Yellow Taxi Tutors, and the late arrivals are straggling in. The shabby basement decor and the dozen or so people in their thirties and forties squeezed into grade school-style desk-chairs suggest a mid-day AA meeting, or a state-mandated road rage course. Yellowing posters of the five boroughs are stapled to the right wall, near a cloth-encircled photograph of the Dalai Lama. The men—and, with one exception, they are all men—sit quietly in the classroom's first four rows, scanning notes and checking phones. Shortly after 11:30 am AJ Gogia bounds out of his doorless back office, clad on this fall Friday in a long-sleeved black t-shirt and blue jeans. Without any formal introduction, he starts redistricting. "You speak Nepali, right?" he asks a student. "Come with me—we're going to put the Nepali brothers together." Three minutes and much chair-scuffling later, the class has been divided into about a half-dozen pairs—Nepali speakers with Nepali speakers, Tibetan with Tibetan, Arabic with Arabic—at which point Gogia retreats back into his office. Small talk erupts in multiple tongues, and cuts off the instant Gogia re-enters the room. Really: it doesn't taper, doesn't dwindle—it just stops. AJ Gogia instructing his class of soon-to-be cab drivers at his school in Jackson Heights, Queens, December 5, 2015. Gogia knows how to run a classroom: he's been teaching people how to pass the Taxi and Limousine Commission's exams for over two decades now. He moved from New Delhi to New York when he was 18 years old, and drove a cab to fund his tuition at CUNY Hunter, where he studied educational psychology. He got a gig at his now-rival’s taxi school, soliciting potential students by waiting outside the TLC's offices at four in the morning. 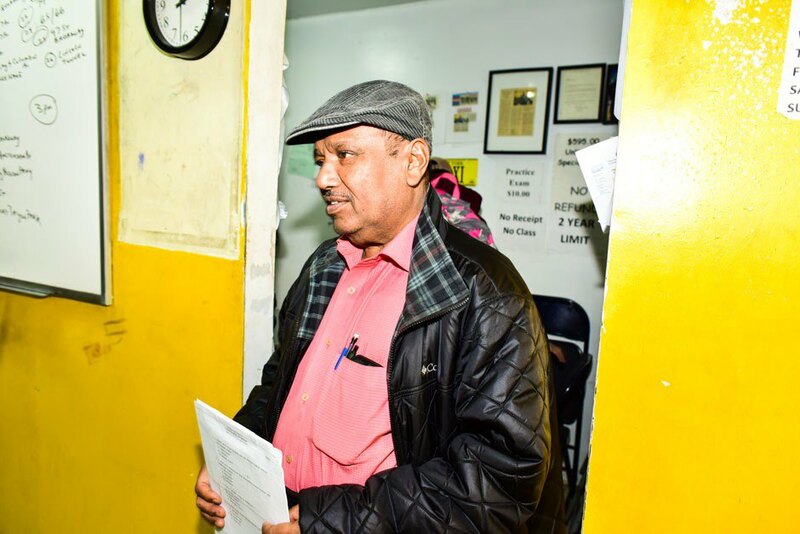 A decade ago he lit out on his own, bucking conventional taxi instructor wisdom by founding AJ Yellow Taxi Tutors in Jackson Heights instead of Long Island City. 167 languages are spoken in Jackson Heights, a neighborhood where the majority of residents—62%—are immigrants. Once a mostly Italian neighborhood, it’s now home to 70 nationalities, and representatives from most of them can seemingly be found in Gogia’s classroom. "This area has Pakistanis, Bangladeshis, Indians, Nepalese, Tibetans, Hispanics, you got it," said Gogia. He's taught Tibetan monks and Pakistani businessmen and (with increasing frequency) the American-born children of Indian immigrants, among many, many others. It's an environment that breeds only-in-Jackson Heights coincidences. Gogia told me of a young Bangladeshi student who seemed to recognize an older man in the class—it turned out he’d been his math teacher back in Bangladesh. 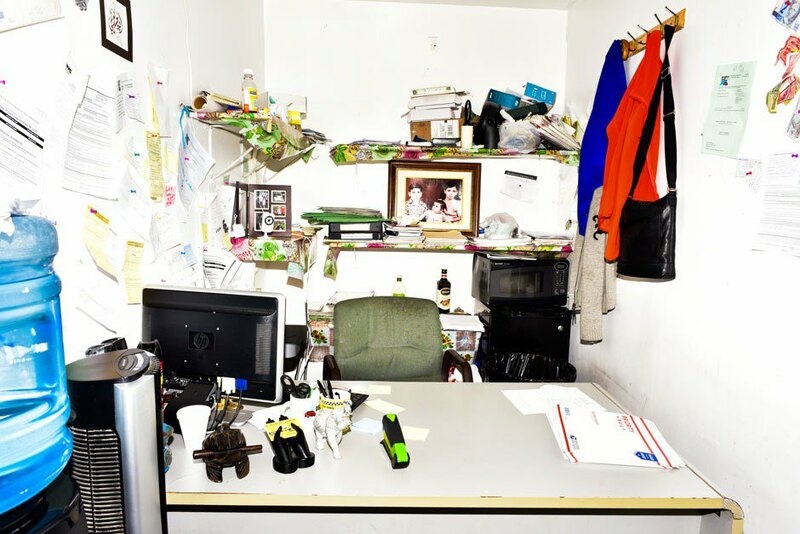 Gogia's desk at AJ Yellow Taxi Tutors in Jackson Heights, Queens. Gogia emigrated from New Delhi to New York when he was 18 years old. Gogia's strict teaching style ("I run this school like a boarding school headmaster from the 1960s," he told Hopes&Fears) is tailored to his immigrant students' upbringings. "That's how all these guys have grown up—the teachers smacking them around," he said. From my time in the class, it was more like Gogia was affectionately parodying a strict headmaster, and getting his pupils to play along. In his basement classroom, his students become schoolchildren again, or (in some cases) become schoolchildren for the very first time: he's taught monks who, before coming to his class, have only studied religious texts. There is homework, an attendance sheet, and a vigilantly-enforced no-cell-phone policy (when a new student's Rihanna ringtone interrupted a problem-solving session, he was forced to donate $5 to a Jackson Heights mosque). He uses "Mr." when addressing his male pupils, but seems somehow to be doing it ironically, like how my 5th grade Hebrew school teacher would call me "Mr. Kolitz" when I was acting out in class. Gogia explains the flow of neighborhoods in Manhattan to his class at his school in Jackson Heights, Queens, a neighborhood where 167 languages are spoken and where the majority of residents—62%—are immigrants. Overlooking a student's notes—popular Manhattan landmarks and thoroughfares. Scattered yesses from the students, all of them hunched over their shared maps. 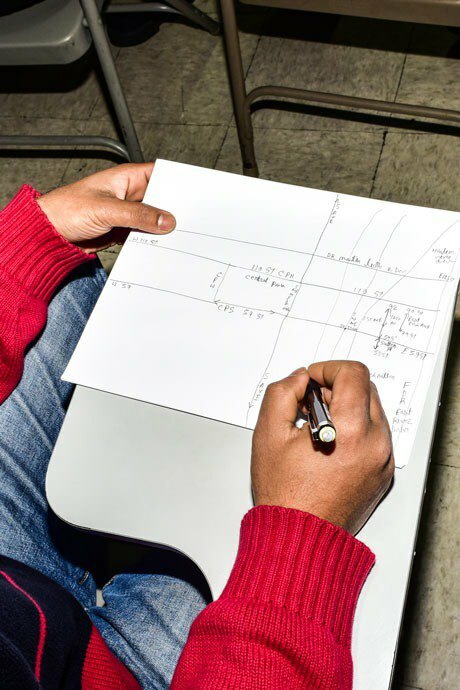 A student at AJ Yellow Taxi Tutors prepares to take the $10 practice exam. The schoolteacher approach risks condescension, given that most of his pupils appear to be middle-aged men, but it winds up being oddly comforting. And the truth is, for all his taskmaster-ish bluster, Gogia is a total softie. He'll write a problem on the whiteboard and circle the room as his pupils puzzle it out, placing encouraging hands on shoulders, saying "you're almost right," guiding them towards the right answer. The chastising, the multi-lingual ribbing—they’re all methods of making his students feel more at home, a service that would seem more and more valuable at this crazy-making moment in history, when irrational fear and the people paid to stoke it have triggered a national discussion of immense relevance to Gogia’s students. Gogia told me he was recently approached about a reality TV show—one which, Orange Is the New Black-style, would delve into his students' backstories and their lives outside the taxi school—but he turned the offer down. "I'm not looking to make a nickel off of these guys—they're here to get a license and be done," he said. It’s solid reasoning. Then again, a show about working class immigrants going to school and improving their lives could be a welcome tonic to the stewing xenophobia within our beleaguered political landscape. But humanizing themselves for various fringe bigots isn’t the job of anyone at this school. It’s their job to teach people how to drive cabs, and it’s the students' job to learn how to drive cabs. Heated rhetoric about immigration and "real America" will continue to fly on social media and cable news, and all the while Gogia’s graduates will be raking it in. 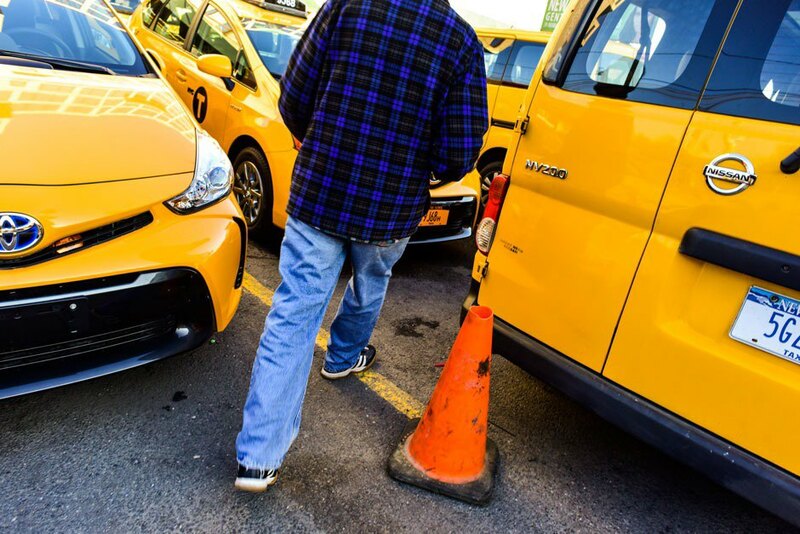 "I'm shocked that most American-born people don't want to drive cabs," Gogia said. When he drove a cab, he was continually surprised to hear how much his American-born passengers were earning. "I'm like, really? I drive a cab and I make more than you—and I'm still in college!"